In an unprecedented move, the Guardian has announced Open Platform – a suite of services that essentially opens up all of its online and newspaper content from 1999. 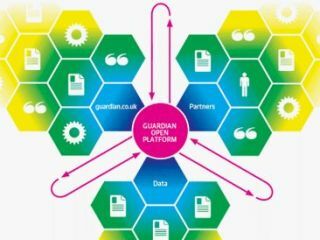 By making available its Application Programming Interface (API), the Guardian is hoping that its content will proliferate through the internet so that, according to the website, "everyone can benefit from our journalism, our brand, and the technologies that power guardian.co.uk". There are two products that the Guardian is offering. The first is access to its Content API, where users can search the vast archive for content which will be fed back for use as an app on your website. The second is a Data Store. This is "a collection of important and high-quality data sets curated by Guardian journalists. You can find useful data here, download it, and integrate it with other internet applications." There are a number of restrictions put in place – this service is in its Beta stage – such as search limited to 5000 queries a day, but the idea that such a vast archive has been opened up is a very refreshing one. Both of the services that make up Open Platform will be ad-funded. Speaking about the new service, Emily Bell, the Guardian News & Media director of digital content, said that Open Platform was a "new chapter in our history and a new foundation for the future of our journalism."